Anyone out there with the butterfly Panerai deployant buckle, could you give me the width of the T bar that attaches to the buckle end of strap( not the bar the folding end). Thanks. Thanks Nad its the swing out part in the upper photo that the buckle end attaches to, The one that has the round bar running through it. Says Swiss Made on it. Thanks for come back. If I am understanding you correctly 22mm wide on the in side? No, the band is 24X22 so thats the strap size and the round bar end length. What I want is the width of the flat swingout part that says swiss made, or the width of the center cutout in the strap that this end fits into, and than the bar gets mounted through it. Thanks doc, I also got confirming info in PM. So the tang style buckle with 4mm tang will not fit the oem style deployant clasp that needs a 6mm notch in strap end. I bought a deployant clasp with a U shaped end that uses a 22mm spring bar. 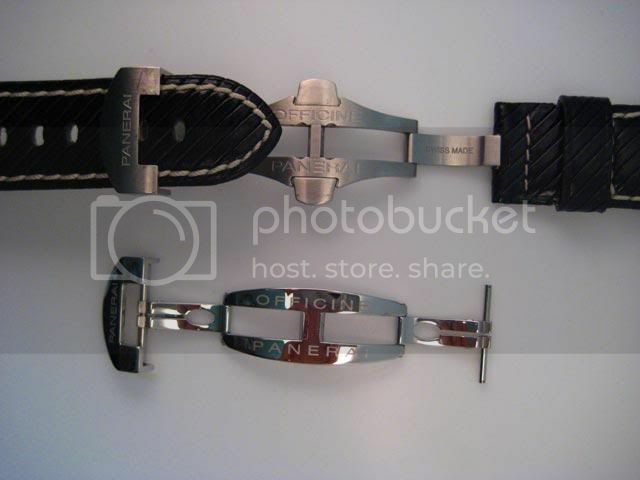 It attaches to the outside of the strap in a more conventional manner than the T bar Panerai uses. No need to mess with tiny screws. The tang will fit, just have space around the tongue. Would not recommend using tang buckle in a strap made for deployant. tang 4mm, deployant 6mm notch. The tongue would move around and wear the $200 buckle. Previous Topic: I missed Friday, but how about a Destro P-Day Saturday?